Hippie clothes. Bohemian clothing. Artsy clothing for expressive women! 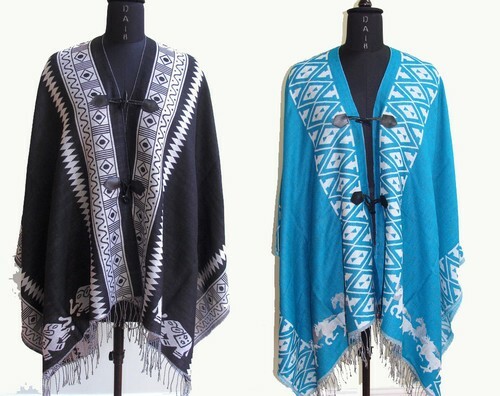 100% Acrylic handcrafted cape poncho with snap sides, toggle closure, and fringe. This is essentially a Mexican inspired serape type poncho created with a large piece of fabric folded in half. This would be great to keep you warm at festivals and bonfires. Check the measurements below. Unless otherwise stated garment measurements are taken this way: CHEST armpit to armpit, HIP 8 inches below waist, LENGTH from top of shoulder to hem, SLEEVE from underarm to end of sleeve, INSEAM from crotch to cuff.Elastic waist measurements are taken unstretched to stretched.Items are measured flat with a measuring tape and then doubled when required. Measure yourself (Chest Waist Hip) with a measuring tape and don't pull the tape tight. It should be loose.Make sure you are measuring the fullest part of your hip usually 8 inches below the waist.